At Bargain Storage, renting storage units is something we do every day. That’s why we want to share some of the most frequently asked questions and answers for folks who are looking for a place to rent storage for personal or business needs. 1. Do you have a storage unit near me? Some of our customers stop by our facilities on a regular basis – to grab a box of holiday decorations, dig out sports gear for the next season or to replenish craft supplies for their home business. Having a storage facility nearby makes it easy for them to pop in and out whenever they need to. We offer several storage facilities in Arizona, Colorado, Oregon and Texas. Click here to find a Bargain Storage facility near you. 2. What type and what size storage unit do I need? The items you store and the weather in your area are two important factors to consider. Our helpful staff can help you find the right storage unit for your needs. You can also find information on types of storage units available in our recent blog post, “What Type of Storage Unit Do You Need?” or visit any of our facilities’ Rates pages to view which unit size can best accommodate storage for a house, apartment, closet or business. Typically, a 10’x20’ unit can hold the contents of a 3-4 bedroom house and a 5’x10’ unit can hold the contents of a one bedroom apartment. 3. How much does a storage unit cost? The size and features of a storage unit determines its price. Our website lists available units and how much each one costs per month. We offer a month-to-month agreement, so you can move out easily when your needs change. We work hard to keep our prices low without sacrificing quality. In fact, our rates are on average 10-12% lower than the competition. Here, you’ll still find the same features you’ll find at the big box chains, just at a lower price. 4. Do I need to pay a deposit? Our storage facilities charge a one-time administration fee of $15, and that’s it. No security deposit. No first and last month’s rent. No surprises. Plus, you’ll get a quality disc lock when you sign your agreement. 5. How do I pay my rent each month? 6. What kind of security should I look for? Bargain Storage facilities have several security measures in place to help protect your storage unit. 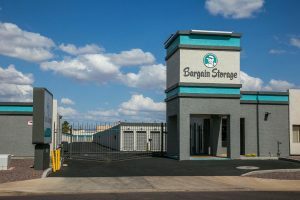 Each facility requires a security code for entry, All customers receive a free disc lock with every storage unit rental, most facilities have upgraded security lighting and all locations have 24-hour surveillance. We also have on-site management to help keep an eye on things. 7. Do I need insurance for my storage unit? Contact your insurance agent to find out if your homeowner’s or renter’s policy covers the items in your storage unit. There’s a good chance your policy already does. If it doesn’t, we can help you find an inexpensive policy for storage unit contents. 8. When can I access my storage unit? At Bargain Storage, we know that our customers have busy schedules. That’s why our storage facilities offer extended gate hours every day of the year. You can get into your storage unit from 6:00 a.m. to 10:00 p.m. in most areas, including holidays. Be sure to verify the hours for the storage unit closest to you here. 9. Is the facility clean? We take pride in keeping our storage facilities neat and clean, while still offering an affordable rate. Feel free to ask your property manager to show you around and explain to you what they do to keep the facility well maintained. 10. What do your customers say about your storage business? We’ve always believed in good old-fashioned customer service, so we love this question. And we appreciate that our customers take time out of their busy days to give us 5-star reviews and recommend us to others. Take a look at our latest customer reviews for all of our properties. Read the comments about a specific facility in the “Reviews” section at the top of the page.